This article focuses on how to win U.S. Federal Government contracts. Many states and local governments also follow a process that is similar. Most government contractors aren’t that good at winning contracts. Their win rates are almost all lower than 50% and some are down near 20%. At 20% you are relying more on luck and a low price than on strategy. If you are new to Federal contracting, then a lot of what you know about winning business is wrong. And it is not the kind of business that you can learn by doing. You have to show up knowing how the acquisition process works and how to prepare proposals that are responsive to it. It’s really easy to develop bad habits. It’s also easy to assume that experience with one Government customer or contract is applicable to all of them. Grand pronouncements about “what you need to do” are often right in one context and wrong in yours. Whether you are an existing contractor with a win rate below 50% or new to Federal government contracting, here are nine areas where we commonly see companies making mistakes. If you want to win like you’re trying to get good at it, they are a great place to focus your reengineering efforts. Are you taking winning seriously, or are you just taking a shot at it? Everything revolves around the customer’s acquisition process. Understanding government procurement is important to positioning your company to be able to win contracts. Are you even eligible to win? Of course, you think you’re capable, but that’s different. Do you meet all of the registration, certification, and qualification requirements? And even if you’re an experienced contractor, understanding the Federal Government’s acquisition process can help you influence what is being procured and even how. For example, what contract vehicle should be used? Should it be procured under the GSA Schedule, through an ID/IQ (Indefinite Delivery/Indefinite Quantity contract), or through an RFP of its own? Can they buy directly from you without an RFP? Or can they use a streamlined acquisition strategy? If you don’t understand how the customer uses their procurement terminology, you’re not taking winning seriously. Every pursuit should put some attention into learning how that customer approaches the acquisition process. Understanding the customer means understanding how they organize procurement. The staff at Government agencies play different roles in a procurement. They go by terms like Contracting Officer, Evaluators, Contracting Officer’s Technical Representative, Program Staff, Executives, and more. But this is about more than titles or terminology. This is about expectations, awareness, and priorities. Each role approaches procurement differently. When you seek information or influence, they all respond differently. What matters is different to each. You shouldn’t approach the customer’s staff as if they are all the same. Learn their different needs and expectations. Your mission is growth. Forget what it says about the company mission on that plaque in the lobby. Growth is the source of all opportunity for a contractor. The opposite is also true. If the organization’s mission is really growth, this should change how everyone looks at their role in the organization. You need them to do this to get good at winning because everyone is in business development, whether they realize it or not. And that turns out to be a good thing. Compliance is just the start. You must create proposals for submission to the Government by following the RFP instructions. Otherwise your proposal may get thrown out without even being read. Complying with the RFP means complying with a bunch of regulatory requirements that are incorporated by reference. So everything from your accounting system to human resource policies may need to be in compliance. You need to understand what requirements are applicable to you before you submit your first bid. Then if you win, you have another set of requirements that you must comply with during the performance of the project. To be a Federal government contractor is to obsess about compliance even more than the customer does. But compliance alone is not enough to win. Every bidder who makes the competitive range will be compliant. The bidders that make the competitive range are your real competition. They are who you must beat, and to do it you must offer a value that exceeds mere RFP compliance. All established Government contractors are capable of being compliant. But a surprisingly low percentage are good at exceeding compliance. They tend to get stuck at doing only what they’re told because they know they’re not supposed to do things that are not compliant. Exceeding compliance and offering the best value is the only path you have to competing on something other than price. Build your pursuit process around what it will take to win and not steps. 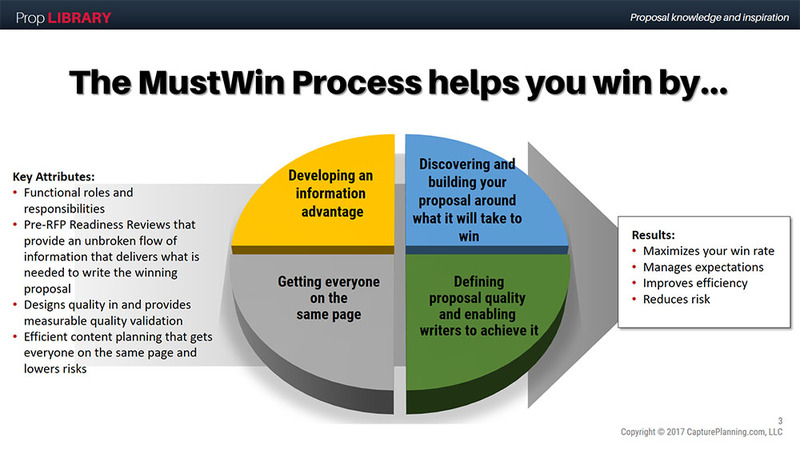 If you're going to get good at winning contracts, you’ll need to develop your pursuit process. But the process most companies have is based on doing tasks they think need to be done instead of discovering what it will take to win and figuring out the tasks that will be required to build a proposal around it. Define quality and your review process around it. The color team model for proposal reviews is like training wheels on a bicycle. You can get started that way, but it’s not going to deliver the best quality. And if you keep them on, if you don’t throw off the color team model, it will hold you back and make you less competitive. You should not define proposal quality based on the opinions of people sitting around a table. Once you’ve defined it, your proposal reviews should not consist of people reading the document to render more opinions. You should validate that the proposal reflects your quality criteria. Milestone or color team reviews do not deliver quality assurance. If you want a high win rate for government contracts you need a proposal review process that is based on real quality assurance. You must unravel the paradoxes surrounding past performance. How do you get a contract without past performance? A neutral rating is the kiss of death. Neutral can’t win against even barely good. You have to think outside the box, try many things, and have patience. It can take years to break in. You don’t just show up and become a government contractor. And be careful about being overly aggressive on price in order to break in. When you finally get your contract, you'd better perform to exceed the customer’s expectations, because you’ll need a top past performance score to win more contracts. One of the quickest paths to failure for a Government contractor is a bad past performance score. It can be better to lose a contract than to win it at a price you can’t support with excellent performance. Understand ROI and overhead math so you can manage your proposals based on ROI instead of treating them like an expense. The amount of your overhead will directly impact your competitiveness, since it adds to your price. But is it better to reduce overhead or increase revenue? The cost of the proposal function is counted as overhead, but your win rate also the single biggest determinant in your growth. Learn to invest in your win rate. But realize that it’s a mathematical problem and the only way to make informed decisions is to understand the math. When you treat your win rate as an investment, you’ll find that you’ll need to track the performance of everything that impacts your win rate and not just make it up as you go along. That’s what most people do and you want to beat them. The nature of your offering determines your path. Do you sell a commodity? Services can be a commodity. Does the customer care about you or the specifications of what you are providing? How much trust is required to buy what you are selling? How well does the customer understand what you are selling? The closer something is to a commodity, the more price matters. The more complex or risky something is, the more trust matters. The bigger the impact of the procurement on the customer, the more value matters. Rules of thumb about trust and price aren’t. It depends on the nature of what you sell. You need to understand that and the customer’s attitude towards it in order to put yourself on the right strategic path.